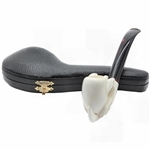 Not sure what you like? 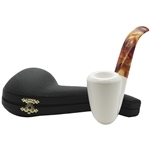 Our entire collection of Meerschaum Pipes all in one spot. 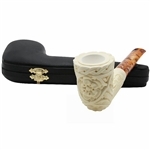 From100% Solid Block Meerschaum to our Royal Meerschaum Exclusive Pipes, Fimo Pipes and more, you can find them all here. 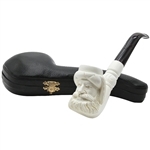 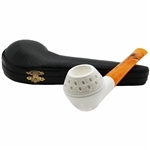 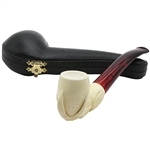 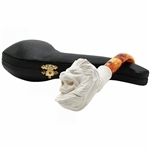 Want to narrow your search for the perfect Meerschaum Pipes or accessory? 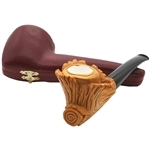 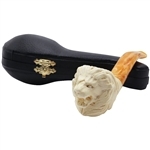 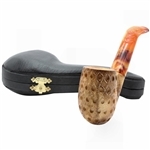 Check out these links Animal Meerschaum Pipes, Classic Meerschaum Pipes, Golden Brown Meerschaum Pipes, People Meerschaum Pipes, and many more great hand finished Meerschaum Pipes. 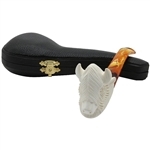 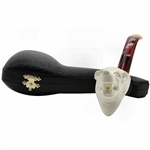 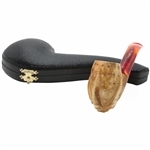 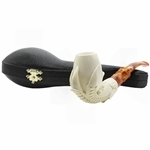 Tiger Meerschaum Pipe is hand carved with a designer lattice knurl and accent..